The polythene sheeting is supplied in rolls with widths of 2 or 4 metres and centre folded along the length for easy use. The clear sheeting can be secured with our duct tape or two-way reinforced security tape. Our poly sheet provides an ideal solution to keep your products from moisture, dust and dirt. It has many commercial and domestic applications. Medium duty polythene sheeting answers to a wide range of general wrapping and protective needs. 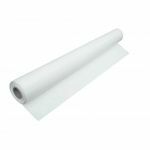 Plastic sheeting on a roll is very flexible and convenient to handle. Use a clear poly sheet whenever you need polythene packaging for items that are not too heavy and have no sharp edges, otherwise for heavier industrial use choose our heavy duty poly sheeting. Our medium-duty clear sheeting offers a choice of two sizes – 2 metres width x 80 metres in length or 4 metres width x 40 metres in length, both 400 gauge. Waterproof and rot-proof, polythene sheeting ensures your items are kept from dust, moisture and dirt. As a packing and wrapping material, you can secure you package when shipping with our strong gaffer tape. Aside from wrapping goods for storage and transport, poly sheets are also perfect for protecting furniture. Coming in a roll, our medium duty polythene sheeting is centre folded along its length for the user’s ease of handling. The versatility and convenience of our plastic sheeting make it an invaluable all-round packaging tool.